Gold and platinum continue to be the most popular metals for wedding rings, but not all the couples choose them. 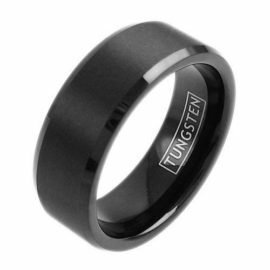 As a more affordable, modern and very nice looking alternative to the classics, tungsten wedding bands have become a popular choice too. Before making a final decision whether you should opt for tungsten wedding rings or not, read these major pros and cons. Tungsten is durable and strong. In general, tungsten wedding bands are scratch-resistant and they don’t bend easily. In addition, its shine doesn’t fade away in several years (which happens to other alternative and precious metals), so your tungsten wedding bands will maintain their luster many years after your big day. Unique appearance characterizes tungsten wedding bands. If you want your wedding bands to look different, interesting and unique, take tungsten into account, especially if you don’t like silver and gold colors. Tungsten is available in black, gray and white. Tungsten wedding bands are more affordable than classics made from gold and platinum. In fact, they are 5 or more times cheaper than wedding bands made of precious metals. This means that, even if you break your ring a few times, replacing it won’t be too costly. Tungsten is hypoallergenic. If you or your future spouse are sensitive to gold, silver and other metals, you should opt for tungsten wedding bands. This material triggers no allergic reactions and you’ll be able to wear your jewelry carefree. Tungsten is brittle. Because it’s, as mentioned in the pros section, very hard, tungsten is more brittle than, for instance, gold. Precious metals are soft and they do bend, whereas harder metals such as tungsten are more prone to breaking. Also, broken tungsten rings cannot be repaired, so they become permanently damaged if they shatter or crack. Tungsten wedding bands cannot be resized, because adjusting this hard metal leads to cracks and breakage. Tungsten is heavy and dense. If you like solid jewelry, it’s not a problem. However, if you don’t want your rings to weigh down your fingers, you should reconsider purchasing tungsten wedding bands. Now, you can weigh down pros and cons and make the final decision that will be the best for you and your other half!